Another first on Bringing up Bella - today we have our first guest blogger! Well, sort of. Ok, not exactly. Here's the scoop: My friend, Cindy, sent me an email this week about a dog who just came in to Buddy Dog Humane Society in Sudbury, MA, where she is a volunteer. Seemed a perfect Saturday 'adopt-athon' post to me, don't ya' think? 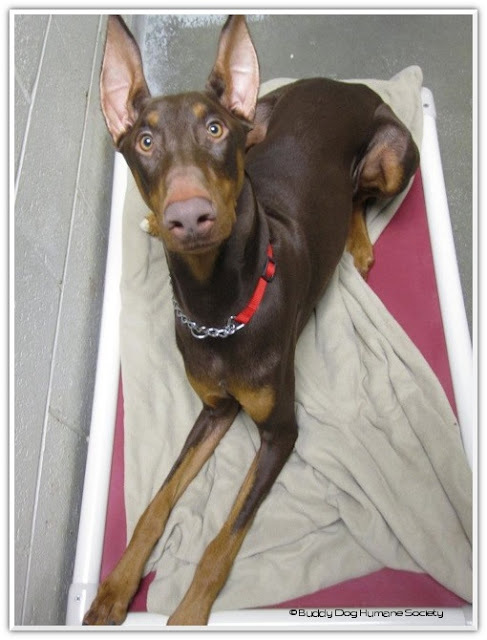 "Copper, a 10 month old Dobie pup at Buddy Dog. He was surrendered when his owner's landlord discovered him -- it was a no-pet apartment. A tough dog to sneak around! Isn't he gorgeous? He's sweet, loves to play, does tricks -- what a dog. Normally I'm against the ear cropping, but his are fantastic!" Of course, I totally agreed on the "Isn't he gorgeous?" part. If you do too, do me a favor and tweet him around and let's see if we can't get this handsome guy a home, ok? Thanks! And for some great lazy Saturday, Thanksgiving recuperation reading, be sure to stroll on through the rest of the blogs in the hop. Oh look at him! Tweeted! Hi Nanny McFur! Thanks for visiting. I do! If he was closer, I'd try my hardest to tempt the fiance. I don't understand how people can be all "Oh, I can of course have a 60 pounds, high energy dog in my no-pet apartment. LOL, nobody will ever know!" No. Sorry. It just means nobody's going to win. Poor Copper, he is adorable, and I hope he finds a home soon. Going to link him on Doberman Talk, maybe somebody knows somebody who will take him home! Thanks - we'd appreciate that. I know Basenji Rescue and Transport scrapes shelter pages looking for Basenjis so they can get them out of shelter situations, I was going to Google local Doberman breed rescues to see any do the same (just haven't had time yet). On the bright side, he's in a good (if not fancy and new) shelter but any dog would be better in a foster or forever home. That said, I try to be understanding (and I have seen some truly heart-breaking situations where families HAD to give up their dogs) but I agree that sometimes people just don't think and everyone, especially the dog, usually loses in the end. But don't worry, nothing bad is going to happen to Copper - he's in a good safe place right now, he'd just be better elsewhere. Just tweeted this handsome fella out to my followers. He's gorgeous. What a beauty! I hope he finds a home soon! Thanks Pamela! He is gorgeous, isn't he? Thanks for getting him some attention. Thanks Elizabeth! Very much appreciated. And yeah, who knows what people are thinking sometimes. At least they did right by him when they were found out. Adorable! Your ears are the best! Wish mine were so unique! Ruff! Hi Nola! He is a handsome devil, isn't he? Thanks for stopping by! Thanks Koot (is it ok if I call you Koot? ;) but you've got those gorgeous (and I'm betting soft!) Labbie ears. Besides, every dog is beautiful and unique to me. :smooches: Thanks for saying hi. According to somebody on Doberman Talk who called about him, Copper has been adopted! Hi Jen, I don't know how I missed your reply with all this great info. Thanks for this! Thanks for the info! I mentioned above that I had heard a rumor of such but haven't had a chance to call to confirm. I'll update the post with this great news! Congratulations, Copper! Hey Hawk! Sorry for the delayed reply - I think Disqus is behaving badly this week. Wooohooo! So glad Copper has a home now!